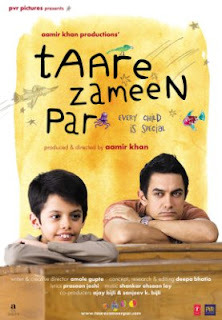 In my earlier post i ve written about innings(that i like) , but now i gonna discuss about a film 'Taare Zameen Par' directed and produced by Aamir khan, which is a classic entertainer about a socially vital subject 'dyslexia'.Aamir khan,in this film believes that every child is special whether physically challenged or dyslexic and Dyslexia is a disorder which spans diversity of symptoms that is normally found in children with above average intelligence,Story is quite simple Aamir as a teacher try to sort out the problems that a child(Harsheel) is facing and in the end he succeeds.This film does not bore a second and he uses his super stardom status perfectly. While climax of the film 'Lagaan' was set in a cricket match and here it is in an art competition, but the effect is riveting and entertaining. I really wont be surprised if this movie gets nominated for Oscars.We rarely see message and entertainment so exquisitely combined in Indian Cinema.We as indians can really be proud of this.